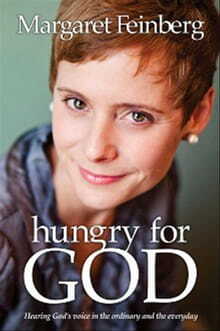 EDITOR’S NOTE: The following is an excerpt from Hungry for God by Margaret Feinberg (Zondervan). As a child I climbed out of bed early each morning, walked into the living room in footie pajamas, and encountered a familiar scene: my mom sitting on the couch reading her Bible. The image is one of my fondest childhood memories. Though my parents taught me countless lessons about God while I was growing up, the sight of my mom perched on the sofa searching the Scriptures was the most powerful. Each morning as she studied and prayed, she gave me a portrait of what it looks like to forage for the divine. Both of my parents taught me what it means to turn life’s routines into adventures and how to keep one’s ears attuned to God along the way. Free spirits who embarked on new undertakings every few years, my parents went from manufacturing surfboards in Florida to building their own end-of-the-world home in North Carolina to living as ski bums for a winter in Colorado — never shying away from new exploits. Because they weren’t attached to a particular denomination, we attended a different type of church wherever we lived. At each new place of worship, I always liked asking the people we met a question: How do you hear from God? “But how do you know?” I’d protest. Others relied on spiritual language. One bubbly churchgoing woman described having something she called a “check in her spirit.” Still others claimed to hear from God all day every day, as if they had a Commissioner Gordon – style red phone at home with a direct connection to God’s heavenly secretary. These people scared me. When I asked my mom about hearing from God, she used much of the same language as everyone else. I knew her words were genuine; but still what she said didn’t compute. None of it was getting through my overly inquisitive tenyear- old skull, and Mom could tell. That’s when she decided to try something different. We prayed together, asking God to speak and reveal himself to me. I had no idea such a simple prayer could be so powerful. One Sunday, the children’s lesson was on how the name of Jesus has power and authority. That night I dreamt I was cornered on the edge of a steep, rugged cliff by a pack of wolves. The ravenous animals snarled; their sharp ivory teeth snapped. If I didn’t do something, I would be torn apart. I remembered the words of my Sunday school teacher and cried out, “In the name of Jesus, go away.”1 Like a hand, an invisible sweeping motion shoved the wolves over the side of the cliff. Then I woke up. God turned a simple dream into a concert hall where he could sing about the power of his Son’s name. The experience taught me that God was real, active, and engaged in my life, and I didn’t need to ascend a magical mountaintop to meet with him. The dream stirred my hunger to know God more and illustrated just how personal God is when it comes to speaking to us. Not only am I a visual learner, but I’m also a visual communicator. God knew this, and in his love used the images of dreams to make himself real to me. I’d hear a sermon with an unforgettable refrain. As a teenager, I often struggled with the awkwardness that accompanies adolescence both in my personal life and in my relationship with God. My first semester at college, I attended too many parties, kissed too many boys, and drank too much cheap beer. Everyone kept telling me that these were supposed to be the best years of my life, so I wondered why I felt so empty and my relationships so hollow. My best party friends on Friday night didn’t remember my name on sober Monday. Something needed to change. My first summer of college, I attended a Christian conference in Colorado. As I listened to the speakers, I felt the hunger stirring in my heart. I was away from God and miserable. I laid my face in my Bible and cried out, asking God to become the center and focus of my life again. Calm enveloped me. In the stillness of my being, the following words ran through my mind: You are my child, and I love you. You are mine; you are not your own. Come back to me. God grabbed me by the scruff of the neck. As God’s child, wholly loved, I found myself running back to Jesus again. Like a kitten flopping as its mother carries it to a safe place, I let myself dangle in God’s gentle grip — and experienced new depths of peace. The faith my parents had exposed me to growing up became my own. God was still answering my mother’s prayer. I didn’t care. I prayed anyway. And when rush concluded, forty of the new members were followers of Jesus. The experience taught me the power and potential of prayer and gave me the courage to make seemingly outlandish requests of God. I had begun listening and looking for God, and he continued to sing over me. Though my faith was coming alive, I made countless mistakes during those years. Sometimes I tried too hard to convince someone of their need for God, and pushed them farther away. Other times I was afraid to speak up. My theology wobbly, my heart filled with pride, my hypocrisy often undermined anything I tried to communicate. Yet I was growing in my faith, recognizing the importance of reading the Bible, and finding God’s voice in my life — if I was willing to listen. One issue God seemed to be silent on was what I should do after college graduation. I struggled with why God didn’t seem to be providing any guidance or direction — worrying that maybe he did, and I missed it. Without an inkling, I filled out applications and collected rejection slips. From the few positive responses, I accepted an internship at a magazine I’d never heard of before in Lake Mary, Florida. I spent the summer learning about publishing and stumbled into a career of writing and communicating, a career which, looking back, God had designed me for. You are mine; you are not your own still resonates in my being years after that Christian conference I attended in college. The words were a turning point in my life. One of the mysteries and marvels of life is that we never know when God will speak or how the words will transform our lives forever. Hearing from God is foundational to a vibrant spiritual relationship with him. We’re created with the capacity to know what brings God delight and to recognize his involvement in our lives. We’re meant to discover God’s passions, pleasures, and pains, designed to recognize his voice and its inflections. I don’t know if my mom had these things in mind when she prayed for me years ago, but I still feel the ripples of her divine request. God’s voice always contains an invitation to know him more, and the process of listening for God beckons us to grow in our knowledge of both the temporal and the transcendent. Such is the lesson in 1 Kings 18 – 19 when Elijah answers the invitation to follow and know God with abandon. Given a “mission: impossible” by God, Elijah is instructed to speak out against the false prophets and wicked leaders ruling over the land. His decision to obey leads to a fiery showdown on top of Mount Carmel in which the false prophets are defeated and Elijah becomes the target of the wicked leaders’ scorn. He escapes with his life, but falls into deep depression. He begs God to let him die. God refuses. Though Elijah doesn’t feel particularly hungry for God, his body cries out for food. Twice God sends an angel to feed Elijah, and, strengthened by the meal, Elijah travels to Mount Horeb. Horeb — a name used by some biblical writers to refer to the Sinai region — is, in the Hebrew Scriptures, one of God’s favorite places to offer invitations. Here God calls Moses2 and invites the Israelites into a divine covenant.3 At Horeb the Israelites accept God’s invitation to travel to Canaan and Kadesh-Barnea.4 It’s no surprise, then, that God meets Elijah in this special place to invite the prophet into a deeper relationship. Elijah is just coming off the crowning achievement of his career: God was faithful to honor his every request as he defeated the false prophets at Carmel. But Queen Jezebel decides to rain on his party. She places a price on his head and promises to have him killed. “How could this be, God?” Elijah must have wondered. The prophet rips into God, alleging that his fervent dedication and willingness to risk everything has been in vain. The Israelites have rejected God, destroyed the holy places, and killed the true prophets anyway. With a bounty on his head, Elijah has nowhere to go. God doesn’t address a single one of Elijah’s allegations; but he does respond. He instructs Elijah to stand on the side of the mountain and wait for his passing. The prophet feels a breeze. A gust of wind lifts his hair in all directions. He brushes a handful out of his eyes before scrambling inside the mouth of the cave. A thunderous wind shatters the mountainside, scattering rocks in all directions. Despite its power and ferocity, God is not in that wind. Hesitant to step outside the cave, Elijah feels the ground vibrate beneath him. He loses his footing and falls to the ground as the earth convulses. Still regaining his composure, he squints when a shaft of fire descends from the sky and a wave of heat blasts across his face. Smoke fills his nostrils. Elijah wonders what’s next. A lightning bolt? A volcanic eruption? A flood? He waits. Finally he hears a thin silence like a gentle whisper. Elijah knows the presence and recognizes the voice. He stands up, dusts himself off, and pulls his coat over his face. Approaching the opening of the cave, God calls Elijah by name and asks the prophet a second time, “What are you doing here?” Elijah offers God the exact same answer as before, as if God hadn’t heard him the first time. Only now does God answer Elijah’s concerns with specific directives reminding him that he is not the last prophet — seven thousand others refuse to bow their knees to Baal. As with Job, God doesn’t give Elijah a full explanation and grant him understanding. Instead God offers and reveals himself. As Elijah is sitting in a musty cave in the midst of a Middle Eastern mountain range, God makes contact with the prophet. Rather than manifest himself in all his brilliant glory and splendid power, God chooses to whisper. The image of a whisper speaks to the posture of our relationship with God. Whispering is ineffective if the person we’re trying to communicate with is on the other side of the room. God doesn’t desire a long-distance relationship, but an intimate one. Though the clamor of the wind, earthquake, and fire garner Elijah’s attention, the stillness of the whisper grabs his heart and brings him to a place where he is able to receive God’s answer. Elijah’s story demonstrates God’s ability to speak into any situation. No matter the darkness I might be in, God has a way of bringing me to a place where I can encounter him. Like Elijah’s, my pilgrimage is often difficult, riddled with silence and self-doubt. Like Elijah, I don’t always get the answer that I want, but the one I need. I’ve wrestled with God over the issue of my health. I’ve experienced days when I’ve wanted to call it quits. Over the last five years I’ve visited countless doctors to try to find a diagnosis and remedy for a stomach illness, which often leaves me fatigued, writhing in pain, and unable to keep food down. Even after eliminating wheat and full-fat dairy from my diet, and adding a regimen of drugs and vitamins, all too often I still find myself in bed with nausea and stomach cramps. Looking at my travel bag of prescription medicine, I feel like a walking pharmacy. I joke that my medicine cabinet could become our retirement plan. Just this morning, I became ill after eating an apple. My body rejected the food. I feel the raw sting in the back of my throat. On this day, as on hundreds of others, I’ve asked God for healing and restoration. I’ve also wrestled God through questions like, Why? Why do you allow this? Why don’t you heal? I know nothing is impossible for God. The Gospels are littered with stories of healing, and I’m begging for the scraps. Despite thousands of prayers, I squat in the silence longing for a healing that I have not yet laid hold of. I often think of Paul, who pleads for God to remove the thorn in his side.5 Some scholars believe the thorn is a metaphor for a physical malady. Whatever form the thorn took, God refuses to remove it, reminding Paul that divine grace is sufficient. The experience must have challenged Paul’s relationship with God. The malady kept him pleading, and yet the experience also taught him to trust God in his own discomfort. My experiences with illness challenge me in my relationship with God. The illness makes me feel what it’s like to hunger and ache and not be able to find relief in anything but God. Will I still wait on God? Will I trust God in the discomfort? As I listen for God in the midst of silence and hardship, I must decide whether I’m willing to give up listening for what I want to hear and begin listening to what God is actually saying. This decision applies not only to healing, but to all of the issues I lay before God. As with Elijah on the mountainside, God doesn’t answer my concerns directly but reveals something else. I’ve sought God on issues of dealing with a difficult person, only to find my own sour attitude spotlighted. I’ve asked for clarity on the future, only to discover God’s in the process of strengthening my faith. I’ve begged for an escape from a heated situation, only to discover that God planted me in a greenhouse of growth. Asking God to speak means we must come to him on his terms, not our own. Too often we look for God in the earthquakes and windstorms when God has been whispering into our lives all along. We’d do well to quit waiting for lightning to strike and instead start looking for God now. When we start recognizing and feasting on God’s words in the everyday, life will become grander. I ask that you would experience the voice and presence of God. I ask that God give you eyes to see the ways in which he is moving in your life, ears to hear his voice, and a heart that beats passionately after the Divine. I pray you will answer the invitation to know God, recognize his voice, and become an example of what it looks like to live with reckless abandon for Christ.